Programmers almost always need the ability to find and replace certain text across multiple files in their projects. Most IDEs provide find and replace functionality. And there are many free tools online to just find and replace text across multiple files. Because I am using Vim as my favorite editor for over 15 years now, it came natural to choose Vim for such job, and not depend on another tool. I used this technique in about 25 of my templates. Then i decided not to use timed expiration of the cache. So I needed to remove the expire argument of the cache method. I needed to remove it from all of my 25 templates. I used Vim to find the needed piece of text to be removed. In Vim, when we need to replace text in a file, we use the substitute command. This should replace the first occurrence of "old_text" with "new_text" for the current cursor line. To substitute all matching occurrences in the line, just add the flag 'g' which refers to global. And to substitute all the file occurrences of the pattern, add the '%' before the substitute command. Vim alerts if it didn't find the pattern, to disable the alert just append the flag 'e'. For a complete documentation for the substitute Vim command, use vim help. Now, after we knew how to substitute text in Vim, we need to substitute the expire argument. we cannot do without using regular expressions. That's because the argument is not the same in all the files, it carries different time values, and may differ in spacing. I will quickly explain the pattern above, but please refer to any of the many tutorials online about Regular expression for more details. The pattern starts with a comma which is the start of the text we need to remove. Followed by a space and a '*' which means a comma followed by zero or more spaces then ':expire' followed by "one or more" "character". And finally the pattern ended with a right parentheses. So our pattern starts with a comma and ends with a right parentheses. Any text matching this pattern in all templates files should be replaced with empty text, or to be specific, with a right parentheses, as the parentheses is already part of the text to be removed. To apply Vim command to all the templates files, I will use the 'args' command. I will pass all the templates files in the app/views folder to 'args' using wildcards, and because Rails store the templates files grouped in folders named after their controllers I will use double wildcard 'app/views/*/*' to list the files 2 levels deep under app/views folder. After I passed the required files to 'args', I can apply whatever command I like to all these files using the command 'argdo'. First I will apply the substitute 's' command and then 'update' which will only save the modified files. Finally, another neat option is adding the flag 'c' which will ask confirmation before each substitution. This is a very nice overview of this technique. Thanks for posting it! Cool. This is pretty useful, thank you. Yes, thanks for this. I've been using vim for years. Perhaps I should be embarrassed for not knowing how to do this already, but mostly I'm just happy that I now can. Yay! Fantastic - very good description, just saved me hours. Thanks! I've noticed that you can run any arbitrary shell command with args. echo "Oops! `pwd` doesn't look like a Rails directory!" ... and you get your whole project tree for handy search-and-replace. The script excludes vendor, svn, log, plus sql files and csv files (if you have any). Also, the script will choke if you're not currently in a rails directory (if you try to run it, vim will produce the cryptic message "E79: Cannot expand wildcards"). This is by design, since a find in the wrong directory can come up with a colossal number of files. Run :pwd in vim to see your current directory. Do :Rcd (if you're using vim-rails) or whatever to switch to the appropriate rails directory. Here's a slightly more maintainable version of the find-rails script. Thanks for this! Well explained. I've been using vim for over a decade now, but there are many corners and abilities I've never really delved into before. This article came up after a simple google, and now I'm a better vimmer for it. Thanks again! Thanks for this post. I've been using Vim for only about a month now but everyday I try to learn something new about it. Today I stumbled upon this post and i'm excited to try it out. Also, thanks for @antipode for the great script. I was looking for a better S&R method over files. Vim user of 6 years and have never used argsdo... Excellent! 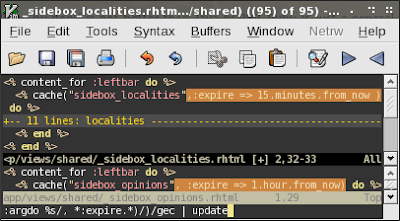 is there a way to revert the argdo changes, if its not possible to apply the inverse regexp to the files? This is very useful. Thank you very much. Excellent; thank you. Your post seems like the only place that the args/doarg search and replace technique is expounded on. Great timeless article, thanks for posting. This article helped me solve a problem today and is likely to save me a lot of time in the future. Great example - thank you! Thanks mate, that was an excellent, clear explanation. This was a huge help to me today. I had to change a method name in 100s of files and this turned it into a 30 minute job instead of 30 hours. To Find & Replace Multiple Words in Multiple Word files use a simple tool. Another useful thing when doing this is to use the :set nomore command to disable the prompt to advance pages when performing the replace on a larger number of files than you have screen lines for.